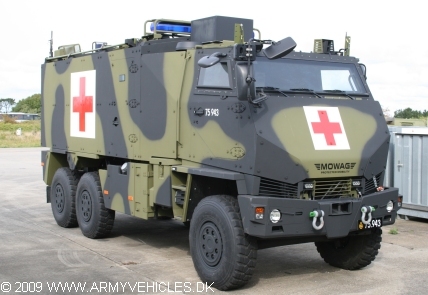 Danish Army Specific: 29 vehicles are scheduled to be delivered in spring 2007. Se also procurement-page. Historical: Bucher-Guyer AG in Niederwenningen, Switzerland started production of all-wheel-drive trucks in 1976. A brake through came with a 3.000 vehicle order for the Swiss armed forces in 1994. The rights to the DURO to the General Dynamics owned Mowag company in 2002. The DURO III 6x6 is a highly mobile off-road tactical transport vehicle, based on the proven DURO family of vehicles. It is a three-axle, multi-purpose vehicle, powered by a six-cylinder diesel engine. The permanent all-wheel drive system comprises a 5-speed automatic gearbox as well as a two-range transfer case. All axle and inter-axle differentials are of the TORSEN self-locking type. The DeDion-type axles are suspended with coil springs, and the stabiliser system allows axle twisting in off-road situations, and prevents body rolling during on-road operation. The upper side of the chassis is free-standing and allows the installation of different superstructures and mission modules while maintaining a low center of gravity. The compact design of the DURO results in low vehicle width and height which makes it C-130 aircraft transportable. The DURO vehicles fulfils a variety of tasks such as logistics vehicles, troop transporters, ambulances, EOD vehicles, ambulances, mobile C3 stations, weapon tractors, etc. Today, more than 4.000 vehicles are in operation world-wide. Length: 6.74 m (262 inches). Width: 2.19 m (85 inches). Height: 2.65 m (103 inches). Weight: 13.500 kg (29.700 lb.). Armour: Protects against light machine gun fire, artillery shell splinters and anti personnel mines. The superstructure is developed by Rheinmetall Landsysteme GmbH. Engine: 6-cylinder Cummins, type ISBe 250, 5.900 cm3 (360 cubic inches) displacement, liquid cooled, turbo charged. Horsepower: 250 at 2.500 rpm. Transmission: 5-speed Allison, type S 2000, automatic. Fuel capacity: 180 liter (39 gallons). Range: 350 km (218 miles). Additional: Permanent all-wheel drive. Hydraulic power steering. On road, the DURO III reaches a speed of 100 km/h and are able to manage gradients of up to 60 % and side slopes of 40 %. Besides the crew the ambulance can carry one wounded on stretcher and three wounded sitting or two wounded on stretchers. The vehicle is equipped with air conditioning which can be connected to external power while the ambulance is on stand-by. The engine complies with the EURO III standard regarding emission.